Data Revolution in Healthcare and Lifesciences Industry: We talk about 600 million subscribers in India- Are these subscribers or Connections? We talk about 600 million subscribers in India- Are these subscribers or Connections? A recent report by India Mobile 2010, shuns TRAI for claiming a base of 621.28 million mobile subscribers at the end of March this year.India is without doubt the fastest growing telecom market in the world, but it had only 304 million subscribers at the end of May this year, according to a report by Juxt Consult. While Juxt survey measures and reports both the mobile users (subscribers) and mobile connections (subscriptions, ie who take new connections), TRAI data reports only the mobile connections, (which it mistakenly calls ‘subscribers’). Apart from that, while TRAI data indicates a 75:25 split in urban and rural mobile connections, the split at both the subscriber level and the active connection level as found in the Juxt report is closer to 50:50. 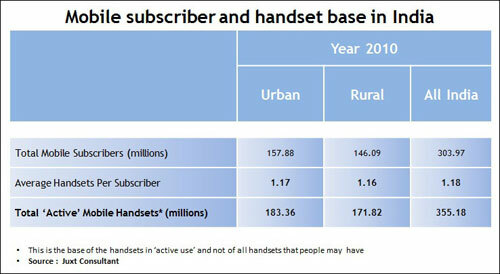 The report says that the mobile subscriber base in rural and urban India is 146 million and 158 million, respectively. Also, according to the Planning Commission, 27.5 per cent of the population was living below the poverty line in 2004–2005, which means that only around 70 per cent of the Indian population can be the target subscribers. 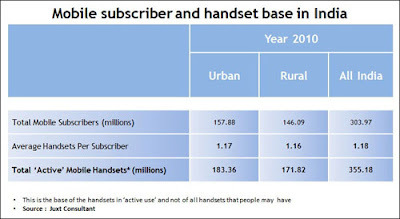 There is little clarity on how the urban-rural split is recorded and reported by operators, and TRAI, and whether all SIMs in use in rural areas are recorded as rural, as many such connections may actually be getting bought in the urban areas. Wynncom has entered an exclusive agreement with a free SMS service application provider 160by2.com. The agreement will allow users to send free SMSs from their mobile phones through an embedded application. Wynncom mobile phones will have a preinstalled application developed by 160by2.com, one of India’s largest free SMS service providers. This unique application enables mobile phone users to send free SMSs to any mobile in India and in the UAE, Kuwait, Saudi Arabia, Singapore, Malaysia and the Philippines. This application will use a GPRS connection to send the SMS, and the charge for data use will be miniscule. Sometimes, I wonder why Mobiles are the only effective source of communication Today? - Think of the engorging Deaf and Dumb population in India! In Australia, more than 50 percent of the general population sends at least one text message a day.The result is a nearly universal, text-based communications medium that connects the deaf to the hearing world. By using text messaging, deaf mobile users can order a pizza or invite friends for a beer. It's great for younger people because their group of friends is extended to their peer group, and not just other deaf people. I remember visiting a Deaf and Dumb village in Kashmir. People in Dadkai Gandoh village of Indian administered Kashmir's mountainous district Doda are becoming victims of an incurable genetic disease, which renders them deaf and dumb. At least 72 such cases have surfaced so far from the village and its adjoining areas. The figures are feared to rise in near future. Developed by engineers at the University of Washington (UW), MobileASL uses motion detection technology to identify American Sign Language (ASL) and transmit video images over cell networks in the US. The tool, which can be integrated to any high-end mobile phone with a video camera, is undergoing field tests involving 11 participants and the researchers plan to launch a larger field study this winter. Earlier, speaking in the valedictory function of E-India, Union Minister for Communications and Information Technology, Mr A Raja said M-health was the fastest growing part of e-health and its importance was increasing. The rapidly increasing importance of mobile phones as a platform for healthcare delivery in recent years is mainly attributable to substantial price reductions and the resulting rapid expansion of mobile phones used around the world, he said. Almost 63 million urban Indians accessed Internet using their phone in February, 2009. 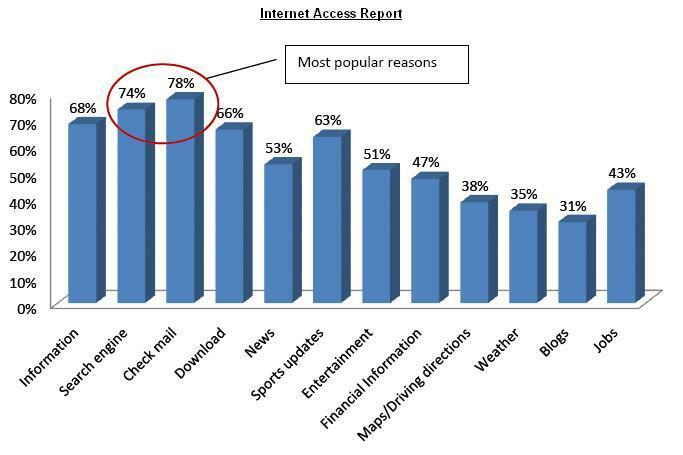 Checking emails and searching information using search engines are the two most popular reason cited by almost 3 in 4 urban Indians. 16 million urban Indians access Internet on their phone almost on a daily basis. As per TRAI predictions, mobile VAS revenue growth contributing to telecommunication industry is expected to grow to 30% in next 5-7 years, which is way beyond the current contribution of 10-12%. Many experts are predicting mobile VAS in India to be 1 billion USD market by 2011. Let us wait to watch, what is there for Mobile VAS service providers in 2011.